Molson Transport in Ontario have been involved with Wheel-Check and have installed the Wheel-Check® on our equipment from the introduction of Wheel-Check® in Canada. Working with our drivers and safety representatives, we have a group working with the installation of Wheel-Check®. It gives the drivers an advantage on inspecting their equipment before leaving on their trips since the drivers have to start at all hours and weather. At this time, we have no reports of Wheel-Check® failing or coming off, and we will be installing Wheel Checks on our future units. In twenty five years in the transportation industry, I have never seen a product quite like this. I must vote Wheel-Check® the best "widget" yet. In August of this year I started to install, test and take a serious look at the costs and benefits of the Wheel-Check® indicators. 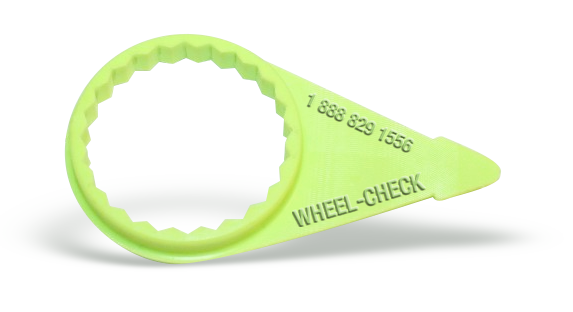 We install the Wheel-Check® indicators during the vehicles regularly scheduled PM time. Then, unless the wheel has had work done on it outside, we do not put a torque wrench on the wheel again. This saves us 18 minutes per service. Two and a half services later the Wheel-Checks have paid for themselves. We also tried to destroy the product with Petrochemicals, by force, and by freezing it to 40º below zero fahrenheit, to no avail, the product integrity remained intact. The drivers love them, on one of our operations a Nitrous Oxide B train has 160 wheel nuts. This unit travels a regularly scheduled run from Halifax, Nova Scotia to Victoria, British Columbia. The confidence the driver has that his wheels are now tight is very reassuring. He has stopped unnecessary stops to have the wheel nuts re-torqued. The drivers like how much quicker they can check their equipment. Also our drivers on slip seat or switch operations, if they notice a red Wheel-Torque indicator, they are then aware they must be more vigilant with this wheel assembly until they reach our terminal. The product also facilitates Official Road Inspections and shows our visual commitment to safety. The maintenance staff enjoy the Wheel-Check® indicators because now they have a visual re-torque check with the red ones. They don't have to rely on paper work flow. Also they appreciate the fact that management care so much about tires and wheels. It also sends a very positive signal to outside repair shops that we want and care about our wheel work being professionally done. Let us not forget the heat sensitivity of the product. While we have not had any bearing failures or brake overheats, as the head of transportation, I'm confident that it will be picked up quickly. Thank you for choosing Air Liquide as the first company in North America to successfully test and use the Wheel-Check® indicators. I am writing in response to using the Wheel-Check® product on one of our highway tractors. We installed Wheel-Check® on a Ford LTL 9,000 which was sent to Quebec for Operation Recuperation. This was the bad ice storm that Quebec and Ontario had. The truck spent three weeks at the storm site moving different pieces of equipment around the different units that were there working. The Ford accumulated 2,500 kms while there in Quebec. After talking with the operators of the truck, we learned that the truck had been through hell and back, as we the mechanics can attest to as we have extensive repairs to do to the truck. But I am happy to report that the Wheel-Check® indicators stayed put, they survived the storm. We never lost or broke any. 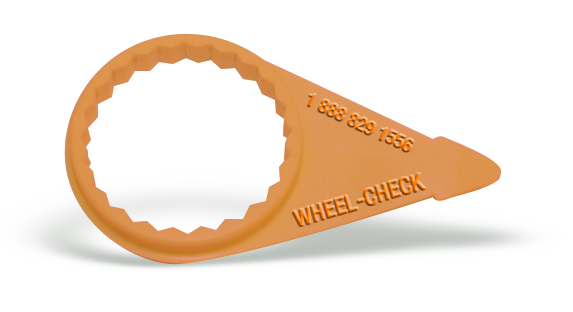 The operators are very impressed with Wheel-Check® as they can now tell at a glance whether or not they have a loose or hot wheel. We have equipped a substantial portion of our truck and tractor fleet with Wheel-Check® indicators. We have found that they are effective in ensuring that any movement in wheel nuts is noticed promptly by drivers and corrected long before any safety situation can develop. On one occasion, within 2 months of starting the program, one of our drivers noticed a "Wheel-Check®" indicator to be out of position during a routine walk around inspection. The driver immediately reported for service which resulted in a wheel stud being replaced. A potential problem was nipped in the bud. 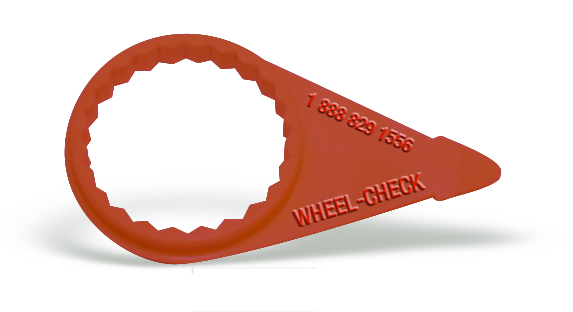 We heartily recommend Wheel-Check® to any trucker as a cost effective safety precaution that can mitigate the problem of wheels coming loose. Just a short note to thank you for demonstrating the benefits of Wheel-Checks. As you know we were re-torquing the wheels on our round forest products fleet every week. With your product installed, we have eliminated the need to perform this every week. 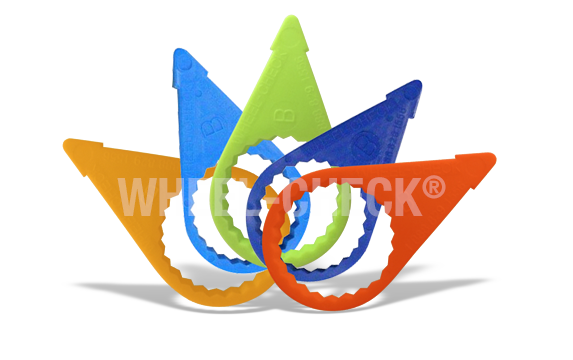 There will be significant savings in time and money for this company with the use of your products.